Sgt. Lesock centre row, 5th. from left. Black plastic A4 display folder. CD soft case with CD. Folder contains printed biographical information regarding Bernhard Hermann Gerstle. CD contains copies of same documents and also copies of photographs of Bernhard & the Gerstle family. Bernhard Gerstle & his family (parents & siblings) were German nationals working in Tehran, Iran upon the outbreak of World War II. In 1941, after the installation of a pro-British ruler to the Persian throne, all German nationals were targeted as threats to national security. The women and children evacuated to Stuttgart, Germany via Turkey, while the men were handed over to British forces. Bernhard was taken by ship (the SS Rona) to Bombay & then to Australia (on the SS Rangitiki). He was then marched in to Loveday internment camp 10, South Australia. In January 1945 the German & Italian internees at Loveday were transferred to Tatura Camp 1. Bernhard remained there until after the war & his eventual release, on 29th August 1946. Bernhard chose & was granted permission to remain in Australia post-war, as did many civilian internees, after their examination by a Committee of Inquiry which investigated their political leanings & other criteria for their supposed suitability as Australian residents. The biography also recounts his employment post-war, marriage in 1952 & his later naturalisation as an Australian citizen. Other material includes Gerstle family history from the perspective of Bernhard's sister & family, who remained in Stuttgart; background on the Gerstle family's Russian origins; and a biography of Oskar Speck, famous kayaker, amongst other things, who was interned along with Bernhard & who became good friends with the family; a brief historical background of the Allied forces/Persia invasion; and extracts of Tatura Camp 3 internee Helga Griffin's book, "Sing Me That Lovely Song Again". Folder: Bernhard Hermann Gerstle/ Gerstle Family/ Loveday and Tatura Internment Camps 1941-1946/ Sydney 1946-1978/ Compiled by Mary Henderson 2013 CD: BH Gerstle; 1941 - Interned by British/ 1941-1946 - Internee at Loveday SA, Tatura VIC/ Sydney 1946-1978. 13 page document, A4 paper. 7 pages of English translation, 6 pages German original. An account of the author's family background & early life, more particularly those events leading to their internment in Tatura, Victoria, Australia during World War 2. The author's parents (author Hermine Wedel, nee Strauss) were of German nationality & practicing as missionaries in New Guinea. 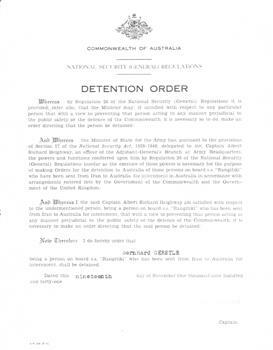 Upon the outbreak of WW2, those German nationals were ordered to the coast by the Australian authorities and the men were transported to internment camps in Australia. The women remained behind, reporting regularly to the authorities, until they too were brought to camps in Australia at the end of 1941. They were eventually reunited in a family camp for internees, Camp 3 at Tatura, in 1943. They were released from the camp to work in Australia in 1947 and the family returned to New Guinea in 1949, and eventually went back to Germany. The author also briefly recounts her marriage & married life in Brazil & Germany. 17 pages of photocopy material, with B/W photos, printed on A4 paper. Held together by a stapler. Painting of the original mansion on front page.